We’re very excited about or newest product, the LotusGrill Smokeless Barbecue; the BBQ you didn’t know you needed… until now. 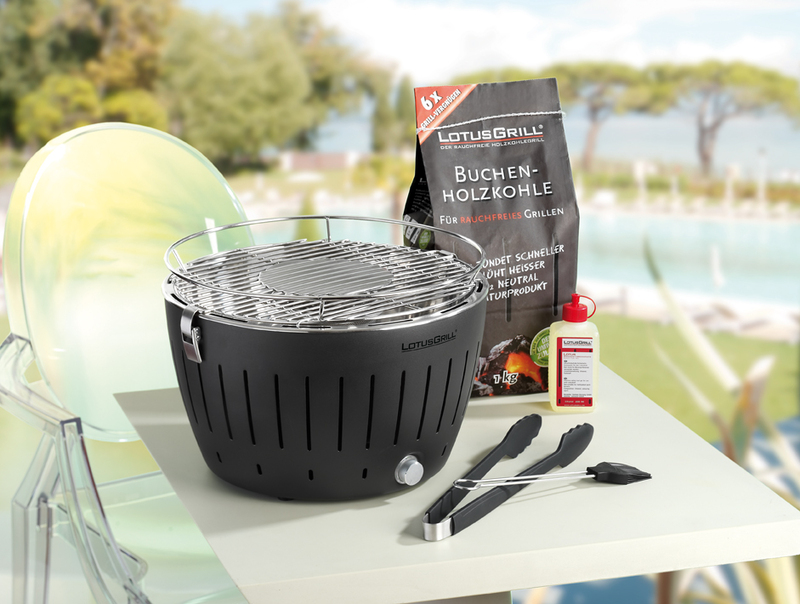 The revolutionary LotusGrill, designed in Germany, transforms the way you barbecue; it cooks your food with that great chargrilled flavour, but with virtually no smoke. The LotusGrill is intended to be the ultimate in portable cooking; because of the lack of smoke it’s perfect for those with limited back garden space, or even those who may only have a balcony to entertain on. 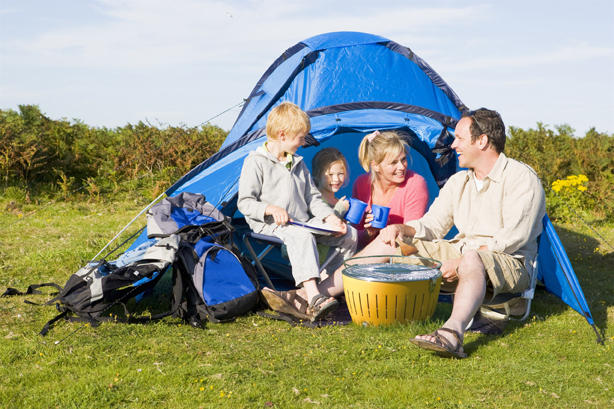 It’s deceptively light so it’s also brilliant for taking camping, on a picnic, to the beach – or even on your boat (as below), that’s if you’re lucky enough to have such a lavish lifestyle! We know what you’re thinking, ‘No smoke? Yeh right!’ – I’ll be honest; it’s exactly what I thought, until I gave the little colourful guy a go… Where we cannot promise absolutely zero smoke, the LotusGrill does significantly reduce smoke emission. You can sometimes encounter a bit of smoke when you first light it, but overall, the lack of smoke is highly impressive. What’s even more remarkable is the absolute delicious tasting food you end up with… even without the smoke, you still get that lovely chargrilled flavour, because natural hardwood charcoal (not Heat Beads) emits these flavours through invisible safe gases. The Lotus is built with a double walled construction so the outer frame and base never get hot, keeping your barbecue completely portable even when cooking…handy if the tide starts coming in! Each component of the grill is clipped down, and the charcoal cylinder is completely protected, so if you happen to knock it over or a pesky football booms at it full pelt, other than grass covered sausages, you won’t need to worry; not a single bit of hot charcoal will escape. It doesn’t emit naked flames, embers, nor requires the mass dumping of hot embers. The LotusGrill only requires 10% of the usual amount of charcoal needed by traditional barbecues, also making it the economical choice. Grilling with this bad boy ensures a low fat, more calorie?conscious style of cooking, excess fat and oil cannot reach the charcoal and burn. Therefore, substances such as polycyclic aromatic hydrocarbons and benzopyrene are not produced like in conventional charcoal BBQ’s. If you think, normally when cooking the fat has nowhere to go, it just swims around your food. The thin metal grill surface of the LotusGrill ensures that excess fat and oil drips into the removable tray, keeping it away from your food. Thanks to the thin metal grate, you also won’t need to add any extra oil as it prevents food from sticking. 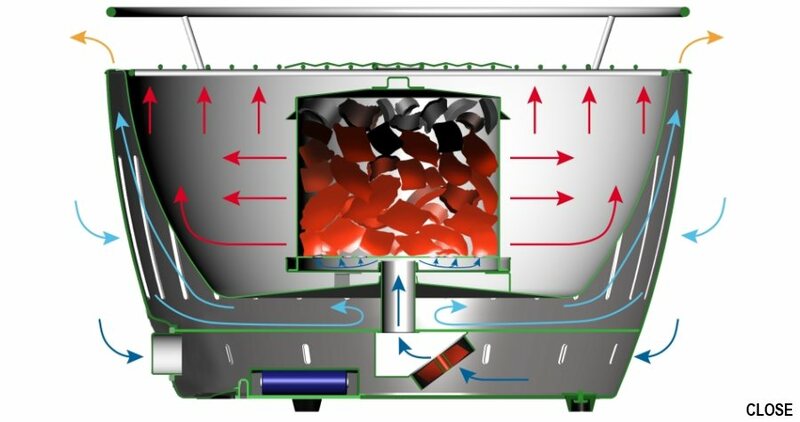 The patented radiant and thermal heat distribution system forces the natural charcoals to burn very quickly and at a high heat, essentially bypassing the smoking process of hot coal formation. So no nasty carcinogens, or other harmful chemicals present in excessive traditional BBQ smoke, involved here. 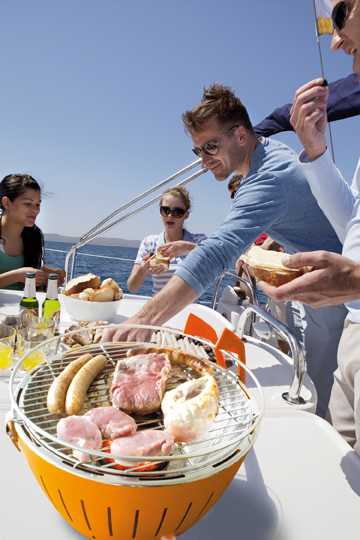 You have total control of your grills heat via the fan dial on the side. This will reduce the likelihood of burning your food, which also produces carcinogens. However, if you want the burnt charcoal effect on your food, then the LotusGrill can most certainly do that for you too. 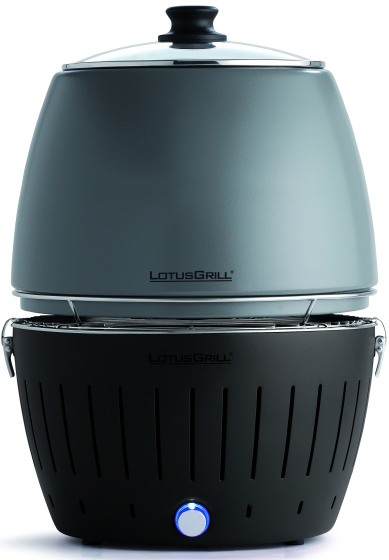 The LotusGrill is designed to use natural hardwood charcoal. This product is not only superior in performance, it is natural and does not contain, nor emit, many of the nasty bonding agents and other chemicals found in briquettes (reconstituted charcoal beads). It also uses an ethanol gel (alcohol) to help start the charcoals. Other traditional charcoal BBQ’s use paraffin and petrochemical ‘fire starter’ products that are expensive and harmful if absorbed into food. 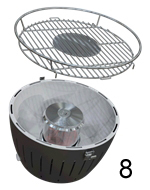 The LotusGrill patented design creates a bellows effect, forcing air over the charcoal. 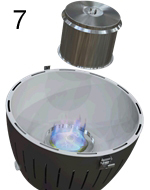 This creates rapid and high heat, essentially bypassing the smoking stage of the charcoal cooking process. 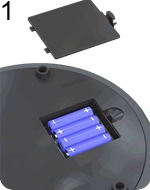 It has a small inbuilt battery powered fan, meaning you have total control over the temperature. The other contributor to smoke is fat burning on the surface and smoke flare-ups when fat drips onto the coals. One of the great features of the Lotus is that the charcoal cylinder is protected from dripping oils and fats – thus no smoke. Naked flames can often burn, stress and contort meat, making it tough and dry, but with the LotusGrill precise temperature control dial and grilling process, achieving perfectly tender food has never been easier. 1. Firstly, pop your batteries in; they will power your fan. 2. Slot the inner bowl back into the case. 3. Fill up your charcoal basket, ideally with LotusGrill Beech Charcoal (any other charcoal cannot be promised to be smokeless). If you can’t use LotusGrill charcoal for whatever reason, try to use natural hardwood charcoal and break it into small pieces the size of a 50 pence piece. 4. Next, you’ll need to pour a fire starter gel on the ignition tray. 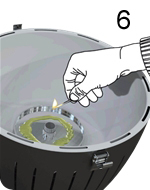 The LotusGrill Lighter Gel is an ethanol based fluid used for starting the BBQ. 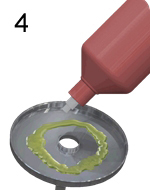 Pour the Ethanol Gel around the centre of the ignition tray, being careful not to spill any through the centre. 5. Slot the ignition tray back in its place and turn the fan all the way up. 6. Once you have turned on the fan, carefully light the ignition fluid. Be careful while igniting the gel, preferably use a long gas click lighter. Also, be aware that this gel has no odour and burns very cleanly without smoke; even the flame is barely visible. 7. Carefully place the charcoal basket over the flame – 250g of charcoal will keep it going for over an hour. 8. Place the grill back on top and clip in to place. It only takes approximately 5 minutes to heat up for you to start cooking! Tip: The exterior doesn’t get hot during cooking, so it can be moved around if care is taken. Thankfully, the LotusGrill is dishwasher safe… The outer frame remains cool and clean so won’t need much more than a wipe over after most cooking sessions, but the inner bowl and grill can be quickly removed and popped straight in the dishwasher (once they’ve cooled down obviously). Apart from the charcoal cylinder, the whole LotusGrill is weatherproof and should resist rust to reasonable extents, obviously if you can bring it indoors during a monsoon style downpour, all will benefit. Tip: Keep an eye on your batteries, if your batteries are dying or one of them is dead, it can affect the fan power and lead to a slower heat up time, or uneven cooking. What Else Can I Do With My LotusGrill? 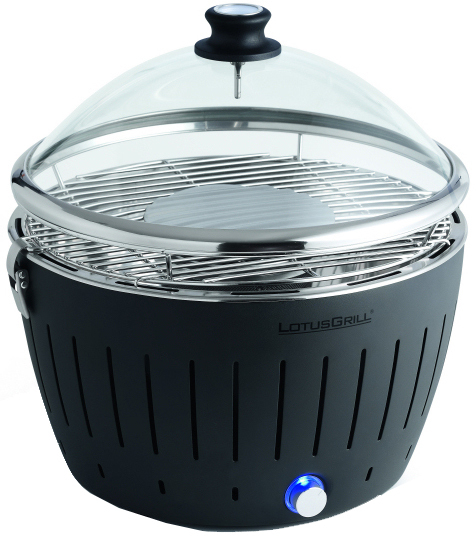 The Standard LotusGrill can cook for up to 5 people with a 32cm diameter, but don’t forget we also have the LotusGrill XL – which cooks for up to 10 and has a diameter of 42cm! Amazingly, the LotusGrill has an optional accessory that transforms your BBQ into an oven (the picture to the right shows how it looks on the LotusGrill). The easy to pop on, Barbecue Grill Hood has a transparent lid (so you can check on the progress of your yummy food) and built in thermometer. Due to the little fan, the temperature can be easily adjusted to allow for roasting and baking at low or high temperatures. 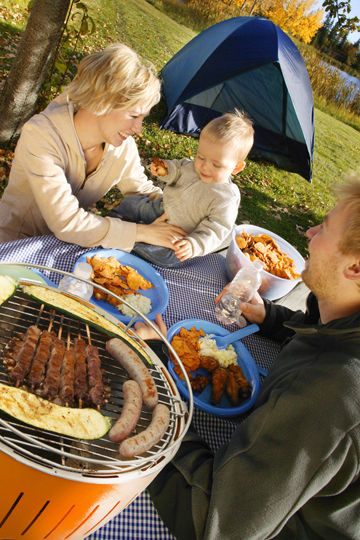 You can do anything; baking, roasting, keep your food warm or even use it as a low temperature barbecue. I don’t know about you, but I absolutely adore pizza, and guess what? The LotusGrill has an optional Pizza Stone! (left) I just died and went to heaven! Simply, pop it on top and watch your pizza cook to perfection, if you have one, you can pop on the Glass Hood to make a little pizza oven. The Glass Hood (right) is also great for quicker cooking, retaining the heat, but you still have the ability to keep an eye on your food without constantly lifting the lid. 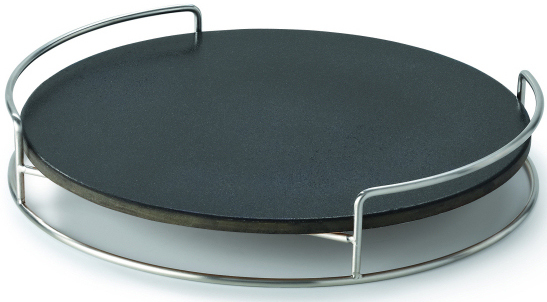 Another great little addition to the Lotus family is the double sided Teppanyaki Plate. It derives from a Japanese style of cooking and is basically an iron plate; one side is smooth, the other is a griddle. This is great for griddling steak, chicken and shrimp, while the smooth side is perfect for food that is too small to go on the standard metal grill. Meaning you can fry up your rice, noodles, egg or vegetables…delicious! And when you’re done with cooking, just pack away your LotusGrill into the handy Carry Bag, which by the way, you get completely free with every BBQ! If you have any more questions about the new LotusGrill, please don’t hestitate to contact us. You can also see more on our YouTube channel, where we have a full LotusGrill Video. Barbecue, Design Innovation Barbecue, LotusGrill, LotusGrill Smokeless Barbecue, LotusGrill Smokeless Charcoal BBQ, LotusGrill Smokeless Grill BBQ, Portable Barbecue, Smokeless BBQ. Bookmark. When testing the LotusGrill with the pizza stone what temperatures were you able to get using the hood? We didn’t fully monitor the temperature, we should have in hindsight! But the thermometer goes up to 300°c and I’m certain we got up to at least 250°c (but may have been higher). You can use either the Glass Hood or the Grill Hood to aid cooking your pizza. For an authentic Pizza Oven experience, the Grill Hood is recommended; although the Glass Hood will do a good job at retaining the heat and fluffing up that pizza too! The main benefit of the Grill Hood is the built in thermometre, and it can be used for cooking other foods in a similar ‘oven baked’ way. On Lotus grill vidéo, it seems like the meat is not cooked evenly, with nice brown and black part. Did you find this? On top of it, does it get real hot, I guess the lid is requires for that. 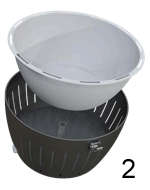 Have you tried the XL, if yes, is the coal basket big enoug to create enough heat on the entire grilling surface? We have sold a considerable amount of LotusGrills and we have never had anyone return one as of yet due to under cooking food. The XL is designed so that the whole grate will get hot, so you would only need the lid if you wanted to use it like an oven i.e. for baking or slow cooking. Can I put a piece of damp Hickory on top of the charcoal to get a smoky flavor to the food. Perhaps in conjunction with the class lid? You can put a piece of damp Hickory on top of the charcoal to get a smoky flavour, but then unfortunately the BBQ wont be smokeless as the Hickory will cause smoke. Can you use this BBQ inside? A LotusGrill should always be used in a well ventilated area, so we wouldn’t advise that you used it indoors. I have just bought a a Lotus grill on Ebay. It’s fantastic, and hardly used. The guy I bought it from got it from you last June, and he has given me the order number. I was wondering, in the unlikely event of malfunction, would you honour the remainder of the 2 year warranty? We will email you to discuss the matter. Is it possible to buy the hood, pizza stone, t-plate in the USA? Unfortunately we cannot send items to the USA. 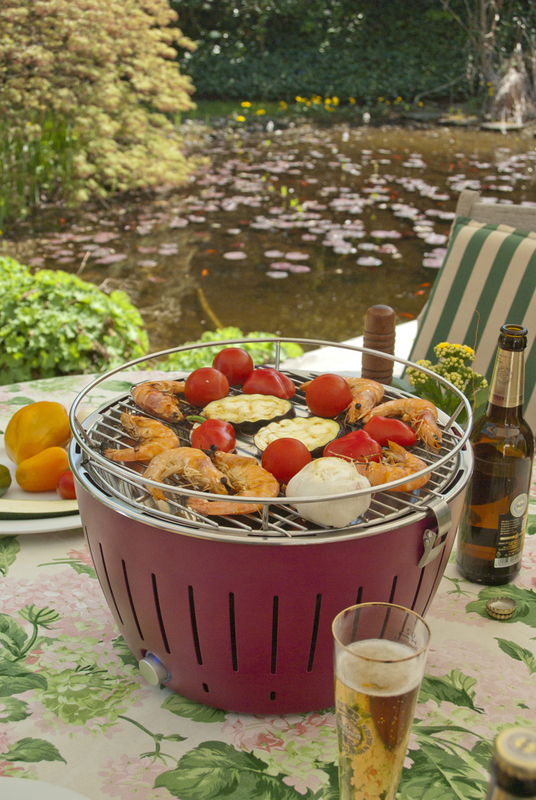 The LotusGrills have been designed to use outdoors only in a well ventilated area. Why is there no Lotus Grill cookbook? In particular, i want to use it to roast a leg of lamb & have no real idea about temperatures/cooking times. We agree that a Lotus Grill cook book would be a great idea, though nobody has come up with one yet! For cooking a leg of lamb we’d recommend using a Lotus Grill hood (these will only fit standard size Lotus Grills). These hoods turn the grill into an oven, but still give you the same great BBQ taste. The hood has a built in thermometer which is really useful. You’ll need the grill at about 200°c and the lamb will need to be cooked for around an hour and fifteen minutes if you like it pink. If you want it well done you’ll need to cook it for longer and keep checking until it’s cooked how you like. Obviously these are only guidelines and it will depend on the size of the lamb. You can find loads of great lamb recipes online! Can I use a different kind of charcoal? You can indeed use different charcoal with the Lotus Grill, however other charcoals do not guarantee the same smokeless effect as the Lotus Grill charcoal. Could you tell me if the glass lid on the Lotus grill hood can be used on its own on the Lotus grill. 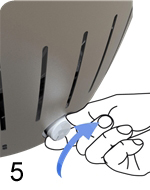 The glass lid can only be used on the hood of the LotusGrill, not separately. I really want to get one of these BBQs – but the main reason for having a BBQ at all is for when we have parties in the summer, so there may be 20+ people to feed. Do you think the XL could cope with that number, or would the batches of food you could cook at the same time just be too small? It’s a lot of money to spend if the result will be a very slow-moving BBQ party! The LotusGrill XL serves up to 10 people, depending on the size or quantity of what you are cooking. For 20+ people you would probably need a bigger BBQ than the LotusGrill XL, or food will have to be cooked in reasonable size batches. When i cook for parties of people >20 I precook the food to some extent anyway, unless I am using a half oil drum. Some people (such as our companies caterers) precook using an oven, but I find using a deep fat fryer works better. The food ends up less dry and the remaining oil is cooked off by the secondary cooking of the bbq. Unfortunately the Teppanyaki Plate only comes in one size which is the standard. However, the Pizza Stone Set comes in two different sizes, one being for the XL and the other for the standard size. What are the main differences between the glass dome and the grill hood? When should you use the dome vs the hood? I’m trying to decide if I should get the dome or the hood or both. Thanks. The purpose of the glass dome is to protect food whilst cooking. The Barbeque Lid on the other hand can also turn into an oven. We advise our customers to purchase the grill hood, because not only does it bake, roast, and keep food warm, it also protects food when cooking. Unfortunately we have never cooked lamb on a LotusGrill before, which means that we are unable to advise you because of health and safety regulations. The best thing to do would be to contact LotusGrill directly where they may be able to help you further. How convenient is the Lotus Grill hood in respect to transporting? It would be good if it somehow fits neatly around the grill in its carry bag… or does it come with it’s own carry bag? I feel this may make the set-up a bit cumbersome and lose the benefit of its compactness. The bag has been specifically designed to fit the LotusGrill BBQ minus the hood. Unfortunately there isn’t a specific bag for the hood so it would have to be transported separately. As the hood is made from glass, it would need to be transported in a more secure/padded case to avoid any breakages. If you would like to discuss any further questions then please contact us on 01432 377089, where a member of staff will be more than happy to assist. Hi is it possible to do bbq without using Lotus grill lighter gel? Is there any possi le way to ignite the fire without need to buy the gel? Or is the gel provided when buying the griller? Yes you can use other lighter gels, but it works best with the LotusGrill lighter gel. 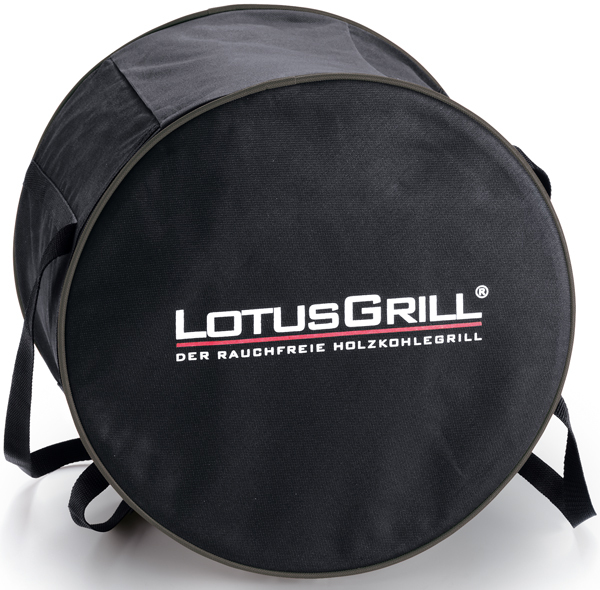 Plus, if you purchase a LotusGrill from us you get a FREE LotusGrill lighter gel and a 1 kg LotusGrill Beech Charcoal Bag. 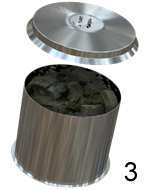 Hi, is it possible to place charcoal directly on the steel bowl without using the charcoal container? I know this defies the point of having a ‘smokeless bbq’ but I am a fan of direct heating when grilling. We strongly suggest that you use your LotusGrill in the way that it has been specified in the instructions. Hi, just bought one of these. Do you think you could add marinade to bowl to flavour meat? No unfortunately not Ben, you’re better off applying any marinade to the food prior to cooking. Marination is usually only performed as a means of enhancing the flavor of the food. It’s primarily done as a means of food preservation similar to placing in brine which is done before cooking the food yet adding a marinade to meat can enrich the flavour. I just got one brand new Lotus xxl. Awesome. But really big! Is it possible to operate with just one half lit up? Cause when we are just 4 people doesn t make sense to light up both containers. Does it effect on the heating of the grill? Should I then grill only on the side that is lit? We have been in contact with LotusGrill in regards to your query and they have confirmed that one charcoal container can be lit as opposed to both when cooking for a smaller number of people. As the LotusGrill XXL is suitable for up to 20/25 people, there will be an opportunity to light both containers and plenty of space to cook more food if you have a larger party to cater for! I am wondering if it is possible to bake bread when using the grill dome and either the Teppanyaki or pizza Plate? If you are referring to the glass hood, then this is used to maintain flavour and heat whilst being able to view your food thanks to the glass. 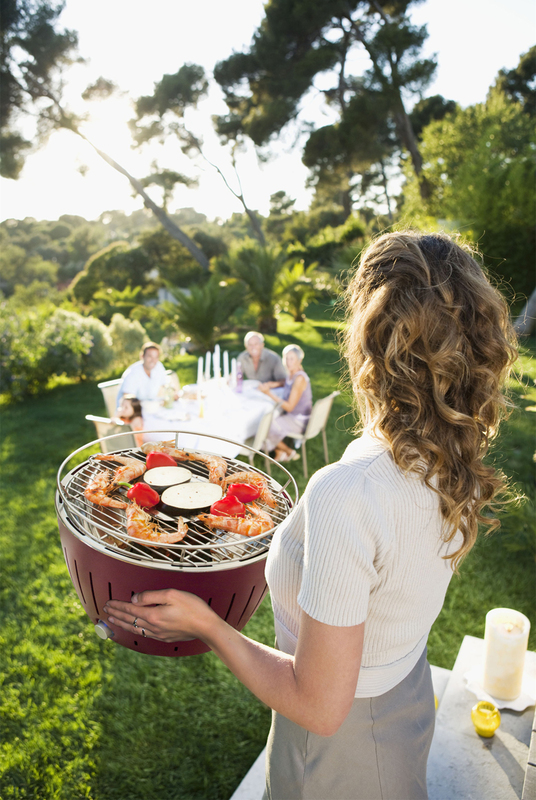 However LotusGrill do have a Barbeque Lid which converts your BBQ into an oven so there is a possibility that you can bake bread although we advise contacting LotusGrill directly first to confirm this. In terms of the Teppanyaki Plate and Pizza Plate, the Teppanyaki plate is designed to grill food such as steaks thanks to its’ griddle surface and is a great all round accessory for cooking all types of food. This sits directly on top of the grilling grid of the LotusGrill® BBQ and the solid alloy plate holds the heat of the BBQ providing a hot and even cooking temperature. With regards to the Pizza Plate, the plate sits on a metal rack so there is less direct heat to help prevent burning. Furthermore the pizza plate is also used with the glass grill hood to convert your BBQ into a pizza oven so you would need to purchase this if you were to cook pizzas. Loving my Lotus Grill here in Dubai! As an American Expat having lived abroad for more than half my life ( as a professional chef) this little grill fab for a small apartment with a small balcony! ( my neighbors sure love it too…. Lol) I’ve had amazing success smoke roasting Pork Belly with crackling… Chicken breast /legs/thighs…. Plenty of steaks…. Even a small roast beef…. Tomahawk Ribeyes…. Etc etc… Combined with my sous vide circulators ( yeah I have all the toys at home too…) I can’t wait to dig deeper and create lots of new dishes! Can I recommend an Instagram hashtag / ways we can help promote… Post photos of foods cooked at home etc etc?